After making plans to connect with Scott’s heir during the New London off-season, I whiled away the afternoon in the Maritime Society’s wonderful archive. Susan Tamulevich, the director, was a wonderful host, and I look forward to going back and spending some serious research hours in their library. I also had the pleasure of meeting David Zapatka. Zapatka was taking down his amazing photography exhibit “Stars and Lighthouses”–a collection of wondrous non-Photoshopped images of lighthouses lit at night with stars in the background. I’ve looked at a whole lot of lighthouse photographs and I’ve never seen any like these. Check them out — I’m saving up for a print. The evening talk had another nice audience and a great discussion. I jabbered about my current book project, which I’m now tentatively calling Shipwrecks and the Making of the Modern Beach. The talk was an opportunity for me to take that difficult step back and try to give a coherent overview of the project. It was a difficult, but invaluable and has helped me immensely as I put together the book proposal. In the next post, I’ll share some of the research and graphics I finished up this summer on the illustrious Captain Thomas A. Scott. Please excuse this shameless self promotion (I blush as I type). 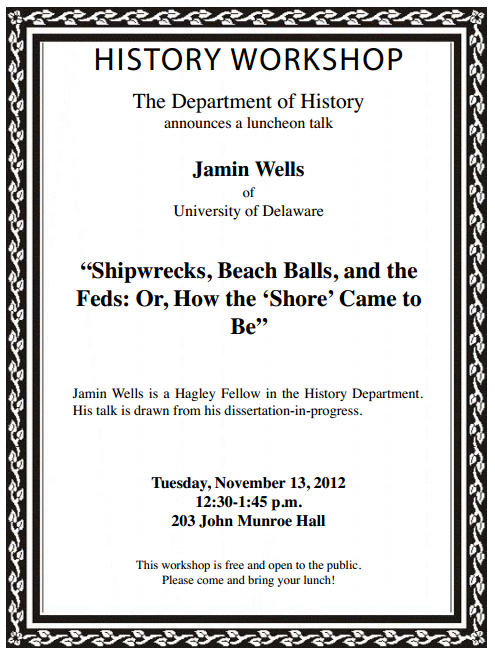 But if you happen to find yourself in the mid-Atlantic tomorrow, I’ll be giving a talk at the University of Delaware. All are welcome. Bring a lunch and come hear a couple of shipwreck stories. For more click here. A research blog that explores the intertwined histories of shipwrecks, coastal landscapes, and the American experience. Ships on the Shore by Jamin Wells is licensed under a Creative Commons Attribution-NonCommercial 3.0 Unported License.